After a successful launch at a major European customer, Maag Pump Systems will formally unveil its twin outlet extrex GDP pump for increasing efficiency in multiple die production. 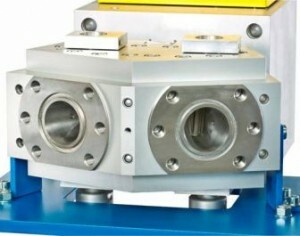 The new extrex GDP series was first demonstrated to limited local audience during Plast 2012 in Milan, Italy. As introduced, it allows producers to use only one extruder to feed two die assemblies with a constant flow. With a combination of one inlet and two outlets, an extrusion line fitted with Maag’s newest pump will be capable of running two completely different die head assemblies with distinct throughput and pressure ratings to produce high quality products. This pump features a novel design geometry delivering a higher degree of effectiveness for the producer of semi-finished extrusion goods. It is designed to improve sealing capabilities and temperature distribution, thus guaranteeing product homogeneity, says Maag. On the other hand, it also reduces potential downtime at operations running only one extruder and switching between processes. According to Mr Thürig, early response is positive.